Thousands of misty-eyed parents looked on, craning their necks to etch a treasured memory or snap a timeless keepsake as the incoming class of 2018 marched behind school banners into Alumni Park, black gowns draped over boardshorts and sundresses. If convocation — a major milestone of Welcome Week — feels like the mirror image of commencement, it’s no coincidence. 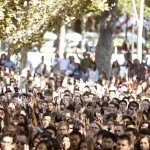 This is the moment when freshmen and transfer students are formally inducted into the Trojan Family. Under dappled sunlight and a soft breeze, an unmistakable air of tradition and ritual suffused the Aug. 21 ceremony. 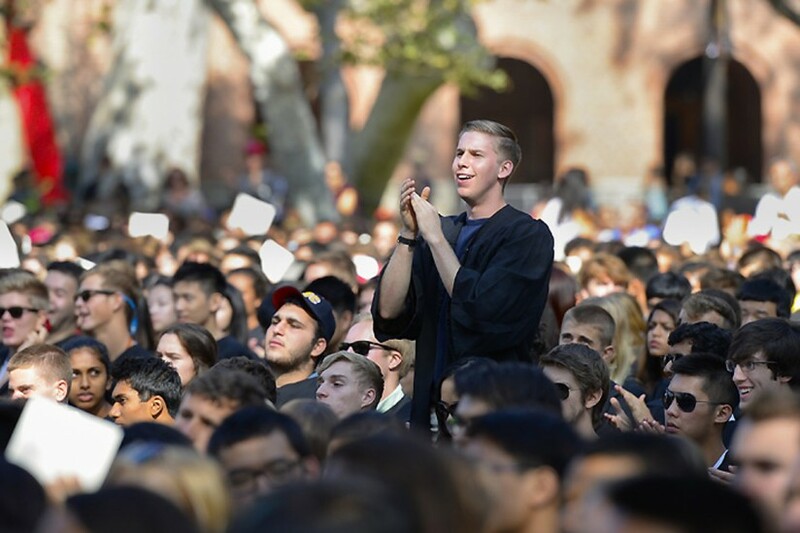 As the USC Trojan Marching Band played “Conquest,” velvet-robed scholars made their way from Bovard Hall to the stage erected in front of Doheny Memorial Library. “Today, the president, the provost — our chief academic officer — and the deans of the schools will officially induct you into USC’s community of scholars,“ declared Ainsley Carry, vice provost for student affairs. President C. L. Max Nikias welcomed the new Trojans into the family. 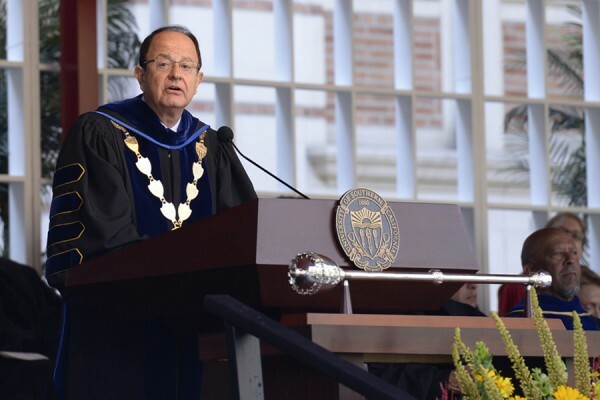 Nikias challenged the incoming class to redefine literacy as a fluency of the powers of imagination, the arts and literature, world cultures, digital media and most importantly, of ethics. The president concluded his uplifting speech with instructions on “a simple gesture” that all Trojans know. Undergraduate Student Body President Andrew Menard added his own words of advice. Jacob Soll, professor of history and accounting, extended his own welcome on behalf of the faculty; then one by one, the deans of each school rose to formally present the student inductees to the president and provost, bestowing upon them “the rights, responsibilities and privileges” of a Trojan. Musical interludes brightened the program. A solo performance of composer Mark Summer’s “Julie-O” showcased the talent of freshman cellist Annie Jacobs-Perkins of Pennsylvania. By the time tenor Blake Howard, a graduate student at the USC Thornton School of Music, sang “Alma Mater,” parental hearts surely swelled. As the event ended, families regrouped, bracing for the tearful last goodbyes. Alice Stafford was already mentally shopping for the care package she would send her son, Matthew, a business major, when she and husband Doug reached home in Scottsdale, Arizona. Patty and Jonathan Shapero of Encinitas, California, trained their cell cams on their smiling son, Benjamin, posed against the USC Thornton banner. Asked if he felt like a Trojan now, the classical saxophone major said he’d been feeling that way since orientation. Asked if he feels ready for his freshman year, he responded with good-natured impatience. 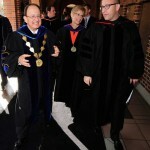 At the New Student Convocation on Aug. 22, President Nikias encouraged the incoming class of freshmen and transfer students to become literate in imagination, the world, the arts, great literary works, digital media and ethics. President Nikias encourages incoming freshmen and transfer students to become literate in the arts, literary works, digital media and ethics. USC President C.L. 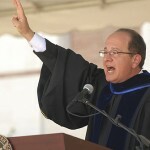 Max Nikias "fights on" at the New Student Convocation. A mother spotted her daughter in the procession of incoming freshmen at the New Student Convocation held in Alumni Park on Aug. 19.